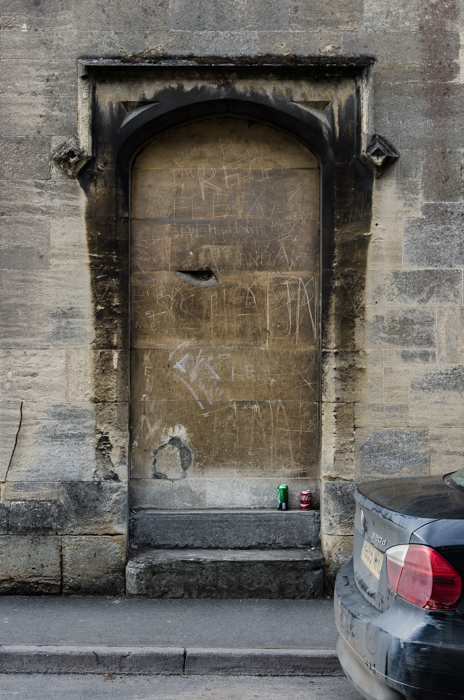 Stephen Riley Photography: Somerset: Every Picture Tells a Story? Every Picture Tells a Story? Every picture tells a story, so the old adage goes. I wonder if that is necessarily so, or if sometimes it is just the case that a story can be told around a picture. This one maybe has a bit of each. I was taken by the fact that this spot, in Bruton, is one of few where there is graffiti of some sort in the town. In an otherwise pretty well-behaved place, this spot – a bricked-up old doorway – seem to have become a blackboard for those who wish to express themselves, publicly, in some way. The leaving of a coke and a lager can seems to confirm the status of this place as a locus of some kind of low-key counter-culture. This is of interest to me as, outside of my professional photographic work, I like to take photographs of places where anonymous individuals have intervened in public space in some kind of inventive, anarchic way. Graffiti is one obvious example, but all too often it is formulaic and uninteresting. This, however, struck me because of the way activity seems to have been confined to, and framed by, this one limited spot, as though the features of the space confer the right to do this. The result seems to me to be a kind of polite, ‘if it’s OK with you…’ kind of anarchy, which is perhaps appropriate to this largely well-mannered part of Somerset. And, like the ancient graffiti often found on the walls of castles and dungeons, something about the timelessness of the indeterminately old stone arch seems to give the writers’ scratchings added poignancy, as though they are messages to (or from) a mysterious past. The other part of the story concerns the fact that just as I was taking the photograph, a man in a BMW pulled in directly in front of me, partially obliterating the view. In an instant, he’d hopped out of his car, clicked the central locking and vanished down the street, making the tail-end of his car a feature of the shot.